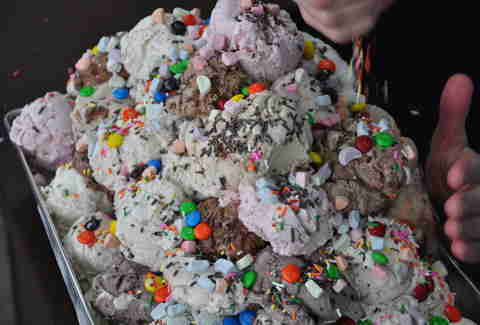 Sometimes ice cream shops have a "Kitchen Sink" on their menu, where they put 5-10 scoops of ice cream in a big bowl, throw some whipped cream on top, and try to bill it as "The best ice cream treat ever!!!" 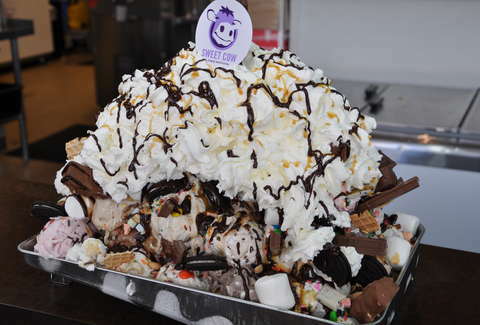 Our sundae would eat that Kitchen Sink for breakfast, and then eat an actual kitchen sink, since it had so much space left. 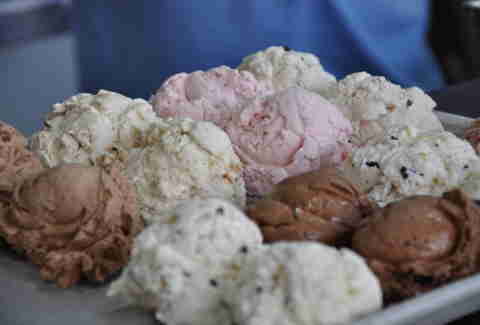 80 scoops of ice cream arranged on a (non-used!) paint tray, a full can of whipped cream, cups upon cups of M&Ms, sprinkles, Oreos, nuts, caramel and chocolate sauce, Lucky Charms marshmallows, regular marshmallows, and a whole mess of full-sized candy bars. 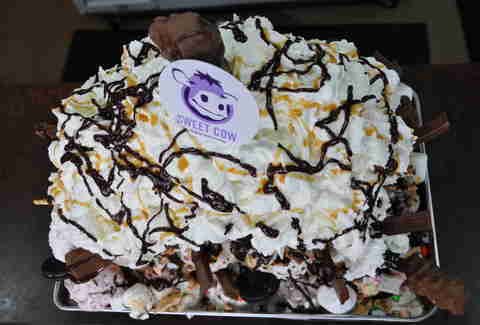 Made with the ice cream and help of Denver's Sweet Cow Ice Cream, this is The World's Greatest Sundae. The calm before the storm. These scoops are about to be formed into a pyramid shape. Go! Go! Go! 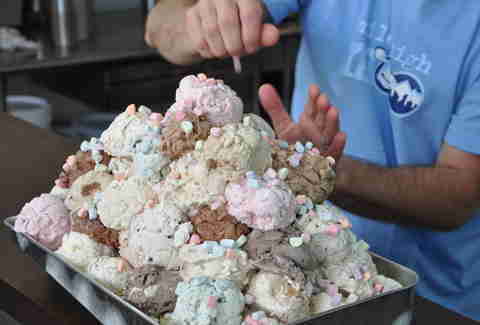 Lucky Charms marshmallows go on top. That means there's a box somewhere with just sad cereal pieces in it. The sprinkles have landed. Repeat, the sprinkles have landed. As have the M&Ms So far, so good bad for you. Oreos make everything better. So do pieces of cone, entire candy bars, and marshmallows feared by Dan Aykroyd. Chocolate, caramel, and so much whipped cream. An entire can, even! Time to eat. Our photographer Devin gave it a whirl and said it tasted like a whole lot of different flavors in every bite. He is not wrong. Clean up time. What, you think he could've finished it?